Digital print, once considered the poor relation of litho, now offers a wealth of opportunities for high quality short runs, personalisation, super-fast turnaround, prototyping, mock-ups, samples and one-off presentation jobs. And here at AB Print Group, we’re able to offer both small and large format digital printing for everything from leaflets and brochures to display and POS materials. Recent years have seen major investment in digital print technologies here at AB, giving us the capability to print pretty much anything and everything digitally: leaflets, posters, brochures, folders, stickers, POS, window vinyls, signage, banners and more. Our small format digital printing capabilities allow us to print up to B3 with Pantone matching and optional spot colour. We can offer in-line high gloss varnishing and we can print on anything from 60 gsm newsprint up to 400 gsm board. We can personalise, we can prototype, and we can pull out all the stops when you need it yesterday. We can handle variable data for individually addressed direct marketing materials (and manage collation and fulfilment too). And with our extended NexPress system (see below), we are the only printer in the immediate region able to offer digital printing of oversize folders, landscape brochures etc. 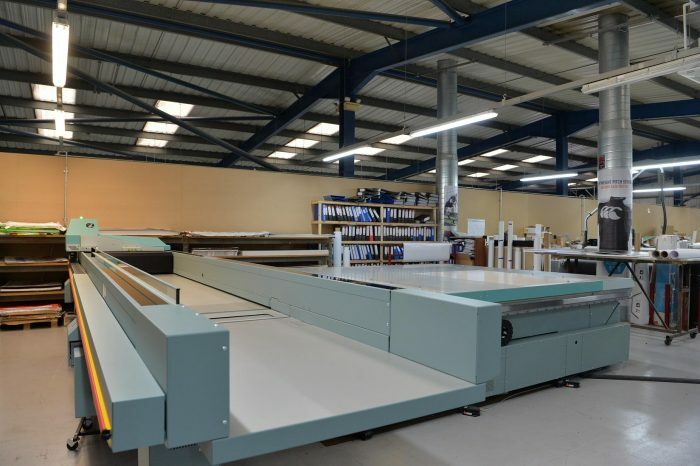 Our large format digital print service offers the same benefits, only on a much bigger scale. Typical applications include POS/POP, signs, indoor/outdoor signage, posters, header boards, standees, window decals, display graphics, wall charts, shelf strips, backlit displays, boxes, show cards, exhibition panels, membership cards, pop-ups, twist system etc., but this is only the tip of the iceberg. We can print directly onto substrates up to 30 mm thick (eliminating mounting costs). We can offer edge-to-edge printing. And we can do it all fast and cost effectively, giving you an attractive alternative to screen printing for short run requirements. Our policy of investment enables us to offer an unusually broad range of digital print solutions, from low cost short run digital printing from A4 right through to large format display materials. With its ‘intelligent’ spot colour and dimensional ink capability, this market-leading digital printing press provides colour output comparable with litho printing. We’ve extended its sheet length capability to allow us to produce 6pp A4 and 8pp A4 leaflets, landscape A4 brochures, A4+ folders and panoramic posters … in fact, we can now offer digital print of pretty much anything you can think of up to a sheet size of 356 x 900mm. The NexPress is also ideal for personalised or variable data print jobs and is perfectly capable of print runs up to 50,000 sheets or more. This Xerox 700 SRA3 digital colour press complements our Kodak NexPress system and is ideal for leaflets, posters, brochures, folders, stickers and more. Our continuing investment in small format digital print technology has not only increased our capacity but also enables us to meet even shorter lead times lead times. With its precision controls, the Spyder V delivers impressive quality and consistency and is capable of handling a wide range of rigid and flexible media up to 3200mm x 1600mm and 30mm thick. Ideal for signs, point of sale displays, stickers, window vinyls, etc. This superb large format LED UV hybrid inkjet printer can be used with roll or rigid media and enables us to print up to 1600mm x 50m at speeds up to 20m2/hr (and the 50m limit is only because this is standard roll length – we can print on rolls of any length). Delivering print results of near photographic quality, it can print on PET film, PETG, self adhesive vinyl and conventional PVC, stock paper, board and even lightweight aluminium.